In November, 2016, the Government of Alberta announced changes to the Public Health Act, aimed at increasing immunization rates, improving capacity to manage outbreaks in schools and communities, and increasing the quality of immunization services. To help meet these goals, in October, 2018, the Government of Alberta established the new Immunization Regulation (Alta. Reg. 182/2018). The Immunization Regulation increases responsibilities for health professionals, including ALL Licensed Practical Nurses (LPNs). 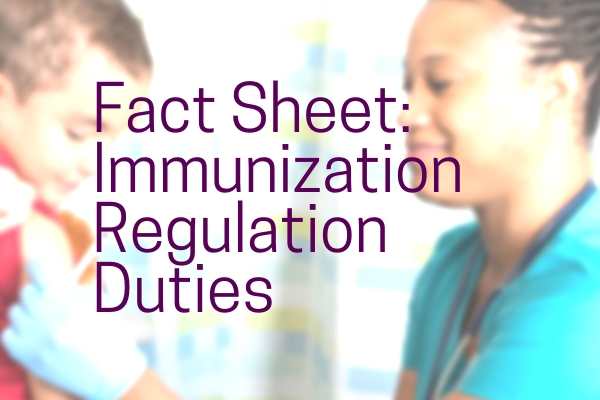 The College of Licensed Practical Nurses of Alberta has developed a Fact Sheet: Immunization Regulation Duties to inform LPNs regarding their responsibilities under the regulation. So does this mean we are better off to have our immunization course or is that what it is saying? The new regulation affects all LPNs whether or not they have their Immunization Specialization. Those with the Specialization have additional duties. Please read the entire Fact Sheet for complete information on the requirements on your practice.